The Prophet of Islam, one of the most important figures in the history of humanity, it is critical to know and understand Prophet Muhammad SAW as so many people consider him to be the best human being ever. 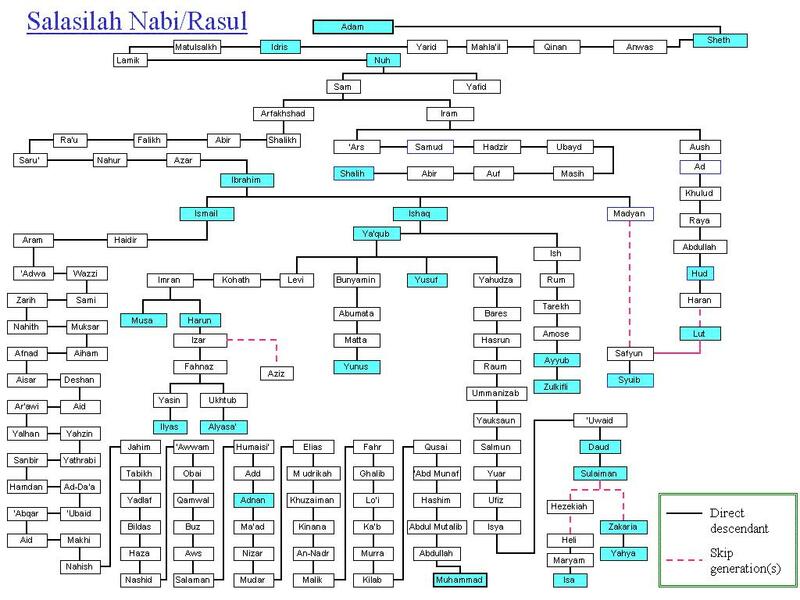 The well-known genealogy of the Holy Prophet (S) is as follows: Muhammad (S), son of Abdullah son of Abdul Muttalib son of Hashim son of Abde Manaf son of Qusayy son of Kilab son of Marrah son of Lavi son of Ghalib son of Fahar son of Malik son of Nuzayr son of Kananah son of Khuzaimah son of Madrakah son of Ilyas son of Mazar son of Nazar son of Maad son of Adnan son of Ov son of Alyasi son of Alhameesa son of Salaman son of Albant son of Hamal son of Qidar son of Ismail son of Ibrahim Khalil (a.s.) son of Tarukh son of Nakhur son of Sharoogh son of Arghu son of Faalagh son of Aabar son of Shaalakh son of Arfahshad son of Saam son of Nuh son of Malik son of Matushalakh son of Akhnoon son of Alyaaraz son of Mahlaail son of Feenaan son of Anoosh son of Sheeth son of His Eminence, Adam (a.s.). His father is Abdullah and his mother Amina. There is some disagreement on the exact date of birth, however it is most likely 17 of Rabi Awwal 570, also known as the year of the Elephant, due to an event said to have occurred at Mecca: Abraha, the Christian ruler of Yemen, which was subject to the Kingdom of Aksum of Ethiopia, marched upon the Kaaba with a large army, which included one or more war elephants, intending to demolish it. Sir John Glubb In 578 Abdul Muttalib died. Before his death, he charged his son, Abu Talib, to look after Muhammad. Abdullah, Muhammad’s father, had been the brother of Abu Talib by both their father and mother. 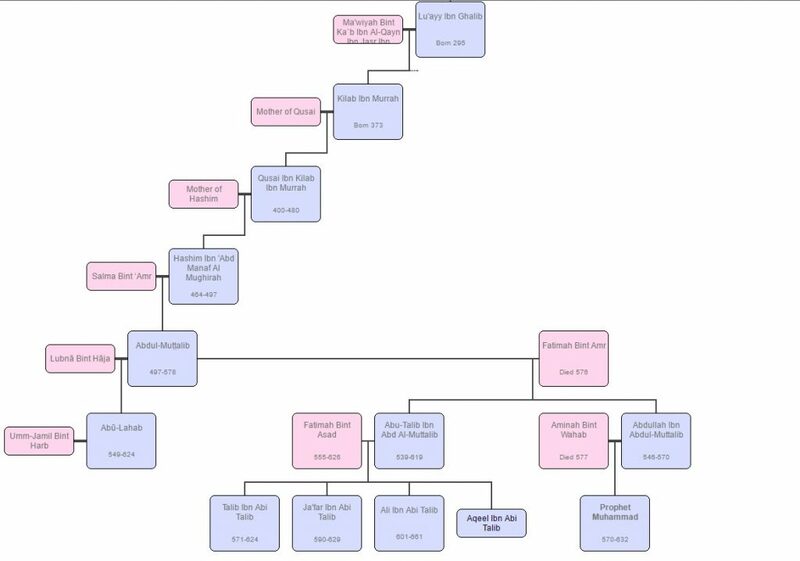 Abdul Muttalib’s other sons had apparently come from different wives. (The Life and Times of Mohammed, 1970) Abu Talib and his wife were very happy and proud to receive Muhammad into their family. They took him not into their home but into their hearts, and they loved him more than they loved their own children. Abu Talib was a man of great dignity and commanding presence. During his incumbency as the leader of Banu Hashim he bore the titles of the “Lord of Quraysh,” and “Chief of the Valley.” Like other members of his tribe, he was also a merchant, and his caravans traveled to and from Syria and Yemen In every season, Abu Talib’s caravans left Makkah for their various destinations. Occasionally, he himself accompanied a caravan to supervise the sale and purchase of merchandise in the foreign markets. Young Muhammad is reported to have traveled with him to Syria with one of the caravans when he was twelve years old. Early in life, Muhammad, the future prophet, built up a reputation for truthfulness, integrity and sound judgment. Since there were no banks in those days, he became a “banker” for the Makkans. They brought their cash, jewelry, and other valuables to him for safe-keeping, and whenever they wanted anything back, he returned it to them. They called him Amin (trustworthy) and Sadiq (truthful). Sir William Muir Endowed with a refined mind and delicate taste, reserved and meditative, he (Mohammed) lived much within himself, and the pondering of his heart supplied occupation for leisure hours spent by men of a lower stamp in rude sports and profligacy. The fair character and honorable bearings of the unobtrusive youth won the approbation of his fellow-citizens; and he received the title, by common consent, of Al-Amin, ‘the Faithful.’ Thus respected and honored, Mohammed lived a quiet and retired life in the family of Abu Talib. (Life of Mohammed, 1877, p. 20) When Muhammad was twenty years old, a war broke out between Quraysh, his tribe, and the tribe of Hawazin. Though he was present in the campaigns of this war, he did not take any part in fighting. He did not kill or wound anyone, thus showing at this early period, his hatred of bloodshed. He is, however, said to have picked up arrows from the ground, and to have given them to his uncles who were fighting. A few years later, Muhammad was admitted as a member into the League of the Virtuous. As mentioned earlier, this League had pledged itself to protect the weak, to oppose the tyrants and the oppressors, and to put an end to exploitation in all forms. It is noteworthy that it was the clan of Banu Hashim, to which Muhammad, the future prophet belonged, which inaugurated the League of the Virtuous. Was it a mere coincidence? There is no way to answer this question. But by their demarche, the Banu Hashim had declared war upon iniquity and injustice. They made it clear that they would not connive at the crimes of the strong against the weak; nor would they acquiesce in the exploitation of the poor by the Quraysh of Makkah. Not many years later, Muhammad was to launch a program for the reconstruction of human society the economic component of which would comprehend precisely the destruction of exploitation. He would take the “privileges” of the Quraysh, and their “right” to exploit the poor and the weak, away from them.